Machine Learning and Medical Imaging presents state-of- the-art machine learning methods in medical image analysis. 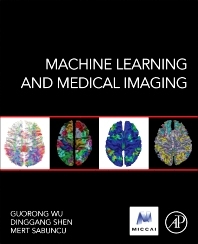 It first summarizes cutting-edge machine learning algorithms in medical imaging, including not only classical probabilistic modeling and learning methods, but also recent breakthroughs in deep learning, sparse representation/coding, and big data hashing. In the second part leading research groups around the world present a wide spectrum of machine learning methods with application to different medical imaging modalities, clinical domains, and organs. The biomedical imaging modalities include ultrasound, magnetic resonance imaging (MRI), computed tomography (CT), histology, and microscopy images. The targeted organs span the lung, liver, brain, and prostate, while there is also a treatment of examining genetic associations. Machine Learning and Medical Imaging is an ideal reference for medical imaging researchers, industry scientists and engineers, advanced undergraduate and graduate students, and clinicians. Chapter 12: Learning pathological deviations from a normal pattern of myocardial motion: Added value for CRT studies? Guorong Wu is an Assistant Professor of Radiology and Biomedical Research Imaging Center (BRIC) in the University of North Carolina at Chapel Hill. Dr. Wu received his PhD degree from the Department of Computer Science in Shanghai Jiao Tong University in 2007. After graduation, he worked for Pixelworks and joined University of North Carolina at Chapel Hill in 2009. Dr. Wu’s research aims to develop computational tools for biomedical imaging analysis and computer assisted diagnosis. He is interested in medical image processing, machine learning and pattern recognition. He has published more than 100 papers in the international journals and conferences. Dr. Wu is actively in the development of medical image processing software to facilitate the scientific research on neuroscience and radiology therapy. Mert Sabuncu is an Assistant Professor in Electrical and Computer Engineering, with a secondary appointment in Biomedical Engineering, Cornell University. His research interests are in biomedical data analysis, in particular imaging data, and with an application emphasis on neuroscience and neurology. He uses tools from signal/image processing, probabilistic modeling, statistical inference, computer vision, computational geometry, graph theory, and machine learning to develop algorithms that allow learning from large-scale biomedical data.